When Trump took his oath of office, it was the American Dream made manifest — business tycoon and macho reality TV icon ascends to the highest position in the land; the tall blonde Eastern European-born model was his wife; the tall blonde American entrepreneur his daughter. On television, his army of pro-Trump pundits and shills replicated that image: craggy, pudgy old white men like Jeffrey Lord argued that Trump’s travel ban was equal to President Abraham Lincoln’s actions during the Civil War, while young beautiful bombshells argued that the president’s conspiracy theories were valid and his legislation was constitutional. On CNN, there was Kayleigh McEnany, asserting that even if former President Obama didn’t wiretap Trump, “something suspicious was going on,” even though there wasn’t a scrap of proof. On MSNBC, there was AJ Delgado claiming that Trump’s new tax plan didn’t favor the rich — even though it does. On The Blaze, Tomi Lahren once again “took down” the Black Lives Matter movement. 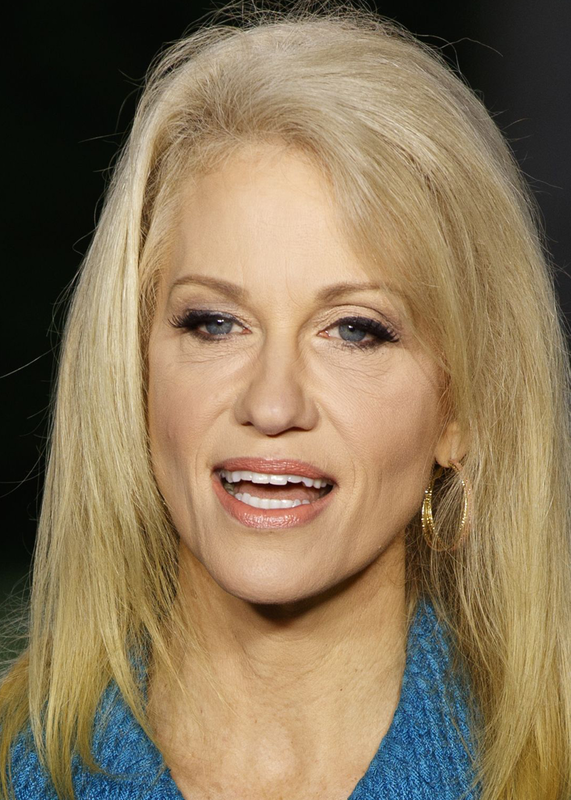 This is all rote Trump administration business by now, but what’s still hard to swallow is the fact that the women who press his message all look like variations of each other. Yes, it’s crass to judge a woman by her looks, but it’s impossible to ignore the fact that the women of Trumpland all share a similar aesthetic: beauty queen. You know the look: Hair that is long, layered and blown to salon perfection; makeup that covers the face in foundation, paints the eyes with subtle smokey shadows, and adds coat upon coat of mascara. There are the glossy puffy lips the color of pink Starburst; outfits that tend to be what your mother would call “smart” dresses — the type of A-line skirt and stiletto heel that is mass marketed for #WomenWhoWork. The dresses are important, as a fit-and-flare frock is infinitely more “traditional” and less threatening than the pantsuits of Hillary Clinton and Rachel Maddow. And while not all the women in Trumpland are blonde, blondes are disproportionately represented. All presidents like to convey an image. “Barack Obama’s appeal was that he came from humble beginnings, so he appealed to the middle- and working-class,” says Jessica A. Levinson, a law professor at Loyola Law School and political commentator. “George W. Bush didn’t come from nothing, but he had an amazing ability to look and sound accessible.” The image Trump projects is money, power, the beautiful model on his arm. In an administration that is all about appearances and very little about substance, this is a key part of his message. Whereas Reagan was applauded for her "simple, elegant style,"and subdued, but glamorous, hair and makeup, the women in Trump's circle embody a more hyper-fem style akin to a pageant girl. The evolution from buttoned up WASP á la Reagan to cleavage-bearing bombshell has been part of a two-decade process beginning with Fox News in the mid-'90s. The conservative network built a reputation for emphasizing its female anchors' bodies over brains (the infamous leg cam; a preference for blondes), a reality even more apparent in the aftermath of Roger Ailes' comeuppance. For most of that time, the schism between conservative-looking conservative women and hot-looking ones remained a clear divide between politics (Laura Bush) and television (Megyn Kelly). Then came Trump to bridge the divide. So why exactly do all of Trump’s surrogates look like members of the same family? (Or, at least, clients of the same hairstylist and makeup artist?) The answer is a complicated dive into the science of attractiveness, the bias surrounding hair color, and exactly what men in power look for in a woman. No matter what the poets tell you, there is a clinically accepted version of what constitutes a “beautiful” face — and that is what plastic surgeons, dermatologists, psychologists, and other experts who study faces call the Golden Ratio. “When experts initially started looking at what makes someone attractive, they started analyzing hundreds of photos of ‘attractive’ people, and they came up with guidelines on how to measure it,” says Dr Clyde Ishii, MD, president of the American Society for Aesthetic Plastic Surgery. The practice, which is called facial mapping, analyzes symmetry in faces. The two easiest ways to recognize if someone is “attractive” according to these guidelines, is by 1) checking whether or not the horizontal thirds of a person’s face are balanced, and 2) whether the golden ratio exists in their central vertical thirds. The three horizontal sections are the hairline to eyebrows, eyebrows to nose, and then nose to chin. All of these areas should be even. We sent Dr. Ishii images of a dozen Trump’s female family members, supporters, and surrogates: AJ Delgado, Allie Stuckey, Ann Coulter, Ivanka Trump, Kayleigh McEnany, Kellyanne Conway, Lara Yunaska Trump, Melania Trump, Sandra Smith, Scottie Nell Hughes, Tomi Lahren, and Vanessa Trump. And we asked him: Do these women all have similar facial ratios? The Golden Ratio isn’t exclusive to white women by the way. Omarosa Manigault, a black woman who Trump met on The Apprentice and is now one of his political aides, also has a face with these proportions. She may be the only person of color he’s invited into his inner sanctum, but rest assured: She ticks off nearly all the boxes for conventional beauty he seems to require. The so-called Triangle of Youth is when a woman’s forehead is wider than her chin. It’s also marked with high cheekbones. When a woman ages, her cheeks tends to droop, making the bottom of her face appear heavier and negating the triangle. That’s why many women will get fillers around their cheekbones — it mimics that youthful, angular shape. This triangular look is considered the most “feminine” of facial structures. And all of Trump’s ladies have it. Dr. Ishii says that these women’s clear skin, eyebrow shapes, and full lips are also indicators of “youth,” which, of course, is an indicator of conventional “beauty” in our society. “All 12 of them possess very feminine features that are youthful and attractive,” he says. And while we hate to make this comparison, Hillary Clinton, now the most recognizable female face of the Democratic party, does not adhere to Trump’s preferred formula. Her lips are thinner; her face is more square, rather than triangular, and her features fall outside the golden ratio. That's not to say she's unattractive — but by the numbers, she's outside of this ratio. Research indicates that even though just 2% of the world’s population is naturally towheaded, 45% of female senators and 48% of female CEOs are, and you can blame race and age biases for that. 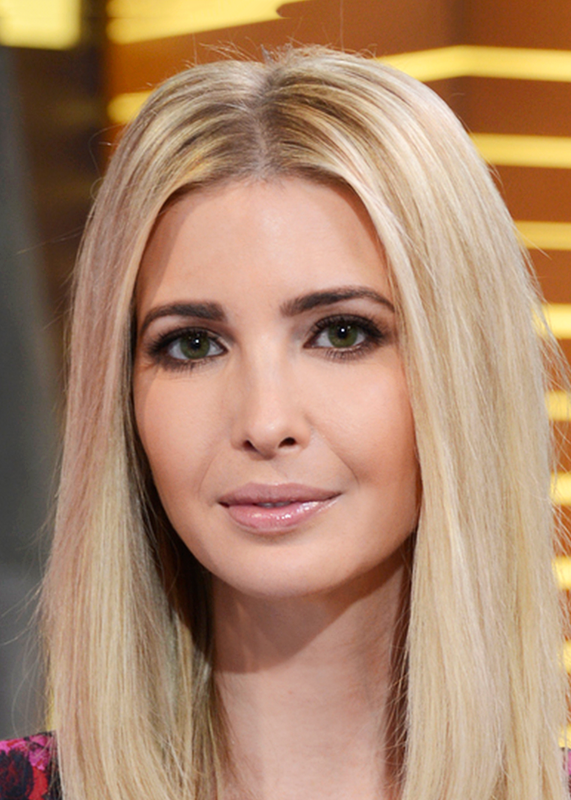 The race component is obvious — blondes are the whitest of whites. While women and men of other races can dye their hair golden, when we think of a “typical” blonde, white people of European descent tend to be the ones who come to mind first. The age piece is also important: because children's hair often gets darker as they age, the light hair color is implicitly youthful. And because youthful implies less-knowing, blondes are also “judged to be less independent-minded and less willing take a stand than other women and than men,” writes Jennifer Berdahl, one of the women who conducted the study, in her blog. Just take an unscientific scan of Fox News, the RNC, and Trumpland, and it’s pretty clear that this is a look new Republicans prefer. “Conservatives may recruit and promote people who fit a particular aesthetic — blond, gender normative, and on and on” says Clark-Polner. In a vacuum, an army of television bombshells wouldn’t be a threat to the strides women have made in deconstructing traditional beauty norms. But at a time when bodies are heavily politicized, it’s concerning to see one of the most unattainable standards of beauty being praised above all others. Trump has been outspoken when people fall outside of his ideal — whether it be Alicia Machado or any woman who has ever sipped a Diet Coke. He claims to have “tremendous respect for women” — but given the way he talks about women in addition to the image of the women he surrounds himself with, it’s pretty clear that his idea of what qualifies as a “woman” to respect is very narrow. A pageant girl with a perfect, youthful face (even well into her 50s) who dresses like an upper class professional is an incredibly tight ideal to fit into. The White House isn’t the Miss Universe pageant, which is itself working to modernize. Consider this one more way the president is behind the times, and attempting to pull us back with him.